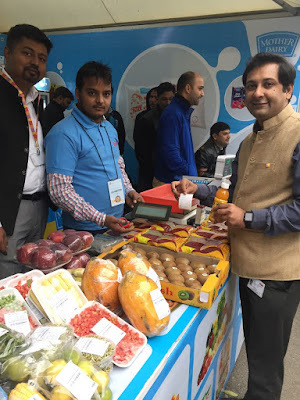 IDFC Bank has announced the nationwide launch of IDFC Aadhaar Pay, India’s first Aadhaar-linked cashless merchant solution that uses a retailers’ own android smart phone to enable cashless payments. Aadhaar Pay has been developed by IDFC Bank in association with Unique Identification Authority of India (UIDAI) and National Payments Corporation of India (NPCI). IDFC Aadhaar Pay will enable millions of merchants across the country to facilitate cashless purchases for customers in a cost effective and scalable way, supporting the government’s initiatives towards boosting cashless transactions. “It is, thus far, the simplest way to pay as it does not require a customer to swipe debit cards, remember passwords, or download apps. Importantly, there are no transaction fees for both merchants and customers. IDFC Aadhaar Pay will accelerate the pace of growth for cashless payments, giving wings to the government’s efforts towards digitization for inclusive growth,” he added. IDFC Aadhaar Pay went live last week at a fair price shop in Andhra Pradesh, inaugurated by Andhra Pradesh Chief Minister N Chandrababu Naidu, and was subsequently introduced to merchants in Delhi and Bihar. Over the past three days, over 100 merchant outlets have been using IDFC Aadhaar Pay. IDFC Aadhaar Pay is a solution made available on a merchant’s smart phone. A merchant is on boarded with IDFC Bank using e-KYC, within a short time span of an hour. An SMS link enables the merchant to download the IDFC Aadhaar Pay app on any basic smart phone. This phone is connected to a STQC certified Aadhaar biometric reader. A customer can pay the merchant with just two fields in the IDFC Aadhaar Pay app - Bank name and Aadhaar number. The fingerprint is the password, thus making it easy to use. IDFC Aadhaar Pay is unique because it is does not compel a customer to use cards, download new applications, remember passwords, account numbers, set up virtual payments addresses, type detailed USSD codes to transfer money, or even have a phone to do cashless payments. In rural and semi-urban areas, where customers need ‘assisted digital’ banking formats, IDFC Bank’s Aadhaar Merchant solution is a perfect fit. The merchant benefits from the medium – as this being a new AEPS payment railroad, it has no merchant discount rate (MDR) attached to it and can provide the service to customers without having to pay the bank a transaction fee. IDFC Bank has been leading on the financial inclusion front by using technology for banking the unbanked. In one such effort, the Bank has placed over 2000 interoperable microATMs (Aadhaar based) at kirana stores, chemists, dhabas, mandis, panchayat offices and other customer touch points, to reduce time and distance taken to access a bank’s branch or an ATM. This initiative has significantly enhanced convenience to citizens in deep rural and semi-urban locations across the country.